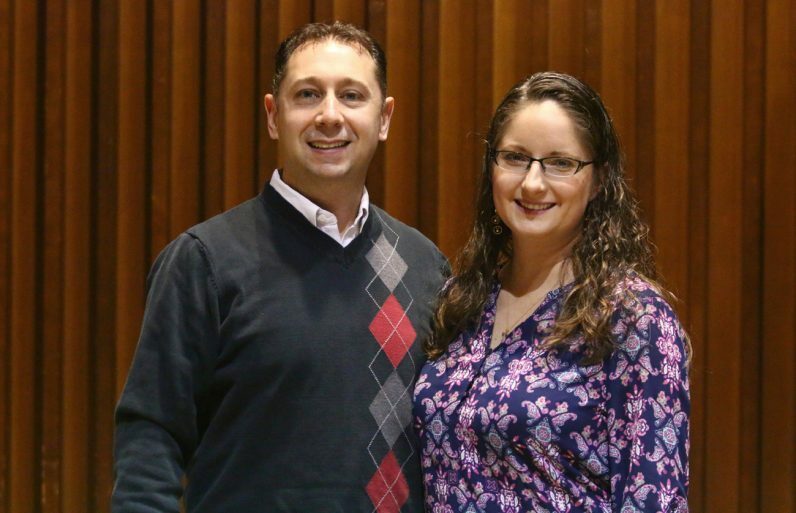 Helene and John Hallowell, members of Our Lady of Fatima Parish in Secane, get to meet quite a few young couples contemplating marriage over the course of a year. John and Helene together teach Natural Family Planning and marriage preparation on a couple-to-couple basis, and the couples they teach are participants in Pre-Cana programs either parish or regional. They utilize programs developed by the Couple to Couple League, a national organization in that field. Natural Family Planning, properly done, can promote conception or prevent conception, as the family chooses. Helene and John also happen to be the parents of five children, Gabriel, Xavier, Liam, Nicholas and Eve, ages 11 to 3, all of whom were joyfully welcomed into the family. Helene is also the Natural Family Planning coordinator for the Philadelphia Archdiocese and a board member of the Pro-Life Union of Greater Philadelphia. Because Pre-Cana is a diocesan requirement before a Catholic marriage, very often couples are attending only because they must. They often come to it with a misconception of what Natural Family Planning is and how it is done. The couples who attend think they know what NFP is but what they have heard about is the rhythm method, which calculates ovulation by calendar dates and has not been used in years, because not all women have the same measurable cycle or may have erratic cycles. NFP charts actual body changes and, according to studies, is accurate 99 percent of the time. “We are really in the business of reeducating and bringing awareness of what is available to couples,” Helene said. While 80 percent of the couples come to the class only because it was mandated, “exit surveys show that 95 percent would recommend it to a friend,” Helene said. “Many, after they hear the personal testimonies and basics on how to use the system, are shocked and wondering why they haven’t heard of it before, whether from the pulpit or from their physicians,” she said. He looks at NFP as part of the pro-life movement in that no babies are killed. “We are involved in standing outside of Planned Parenthood and fighting abortion, but talking to couples ahead of time is really what Pope Paul VI talked about in Humanae Vitae,” he said, citing the pope’s 1968 encyclical on human life. Helene is a graduate of Bloomsburg University and like so many young people, fell away from practicing her faith for a time. She traces her return to the tragedy of the Sept. 11, 2001 terrorist attacks. “It scared the pants off of me and I ran back to the church,” she recalls. Eventually she became involved in Generation Life and her pastor, Father John Gabin, asked her to join the parish pro-life committee. As for John, a Penn State graduate who works in the insurance field, he was also active in pro-life causes. A committed Catholic, he was undecided if he should remain a layman or study for the priesthood. Before they met, as Helene remembers, she was in her mid-20s, just living in an apartment with her cats. John has a slightly different memory. It was a mutual friend who was unfortunately incarcerated and Helene was writing to him, hoping he would find God. Now they have been married 13 years, their kids attend Regina Angelorum Academy in Ardmore, and they feel blessed. Together, they work as a team to spread the news that NFP is a safe, reliable method of inducing pregnancies or spacing pregnancies without violating church teaching on artificial birth control. Another option often overlooked in the NFP discussion is God’s plan for natural birth spacing with the right kind of breastfeeding. Taking nature as the norm, ecologically breastfeeding mothers may go 1, 2 and even 3 years without menstruation. Two published research concluded that American mothers, on average, go 14 to 15 months without menstruation when following the Seven Standards of eco-breastfeeding. The Seven Standards are maternal behaviors associated natural mothering and mother-baby togetherness. This option, by the way, involves no abstinence and offers many health benefits to both mother and baby, even after the breastfeeding has ceased. For more into, go to http://www.NFPandmore.org.